Once again, this year’s Christmas cards were in limited supply. There was just not enough time, and if it wasn’t for a snow day on the Friday before Christmas, there would not have been any. The construction of the cards was simple in my mind, but time consuming. First, I bought some 8.5 x 11 green paper from Calli and Co, but it wasn’t as dark as I had hoped. 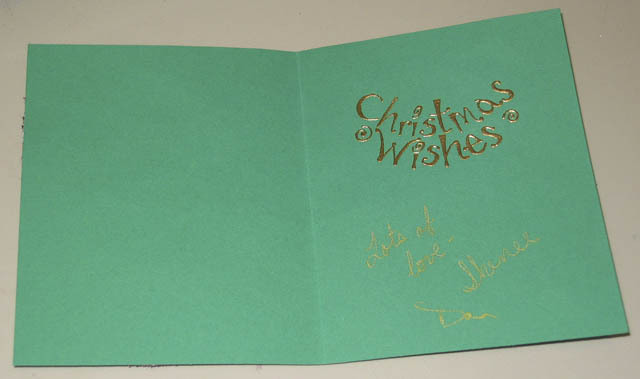 To make the cards, I cut the page in half, and then folded the halves with a bone folder. Instead of matting the front with more paper, I bought some flannel at Joanns and ironed interfacing on the back to help limit fraying. I cut the fabric into rectangles that were 3.75 x 5 and glued them on. I cut off the corners that hung over the edges of the card. 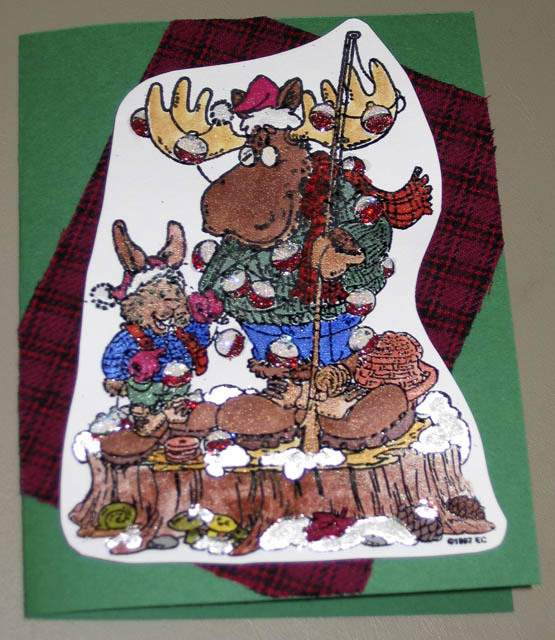 I borrowed the moose stamp from my mother-in-law. I stamped it on plain white cardstock with embossing ink, and then heated black embossing powder on it. I painted it in with Twinkling H2O paints. The bobbers were filled in with glitter glue (red and white) and after they were dry, I used Judikin’s Diamond Glaze to make it dimensional, but clear and smooth. Originally, I wanted to fill in the “snow” with crushed velvet. However, I lost the bottle that I bought. Through my searching, I found some tiny white and clear beads. So, I used some other dimensional glue to fill in the snow sections and then I sprinkled the beads on. I was going to get more elaborate on the inside, but I was running out of patience and time. So, I simply stamped the inside with embossing ink and heated gold embossing powder on it. We both signed in gold pen and voila! It was finished!